The Spanish telecommunications industry – like most if not all European markets – is witnessing rapid changes from market liberalisation. 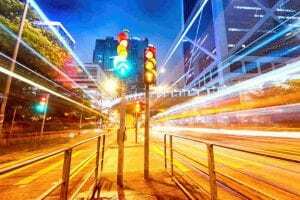 Commercial organisations, keen to take advantage of the developing network services and benefits, are implementing significant communications infrastructure improvements. The financial sector is a prime example where investment in the right data communication solution cuts costs and offers premium service to their customers. Gesmosa is a major broker in the Spanish financial market. As one of the societies belonging to the Ahorro Corporación, Gesmosa provides voice and on-line data information services to 52 regional savings banks. Investors need information quickly on financial and stock markets. Gesmosa’s objective was to provide the best communications service for their customers, brokers and banks. Instant updates on financial data and the capability for stock brokers to verbally buy and sell shares would be fundamental to this service. Vital considerations were speed and quality of communication for both voice and data. Gesmosa decided to carry out an innovative project to improve voice and data services to the savings banks. This would be achieved through a closed user group providing voice communication between dealer rooms, and having access to instant financial market data updates. The network must be scaleable to meet future customer demands. Financial markets cannot afford downtime! Ability to expand services easily. The choice of equipment was critical for such an important network. After analysing the network services offered by the market and testing several vendors’ equipment, Gesmosa decided that Case Communications’s solution would provide the most efficient and reliable service for voice and data integration. The KMX 9000 Series was chosen for the dealer desk terminals due to its powerful integration properties and quality voice compression, and Case Routers provided the speed of communication for the on-line data terminals. KMX 9000 Series provides the highest quality of voice achieved at only 9.6kbps and 6.4kbps, integrating the voice channels into the 64kbps or 128kbps network connections with a high-speed data channel. 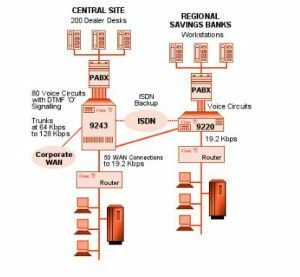 For data communication, Case Communications’s routers introduced a unique solution for Gesmosa, offering data compression and high performance – again to a level other vendors could not achieve. Ease of management for both products allows Gesmosa to maintain the highest levels of service from the central site. Gesmosa have a unique solution from Case Communications and have implemented the first Corporate Network in the Spanish Financial Sector. Case Communications is a major supplier of Integrated Communication The solutions in Spain, and has proved to the complete satisfaction of Gesmosa – a key organisation in the Financial Sector – that the best is possible. Case Communications is an information technology company specialising in networking products for the efficient integration of voice and data. We are the leading manufacturer of networking products in Europe. We have over 30 years experience in the design and manufacture of award-winning products. Through our authorised partners we are able to provide networking solutions and support for our customers wherever they may be.